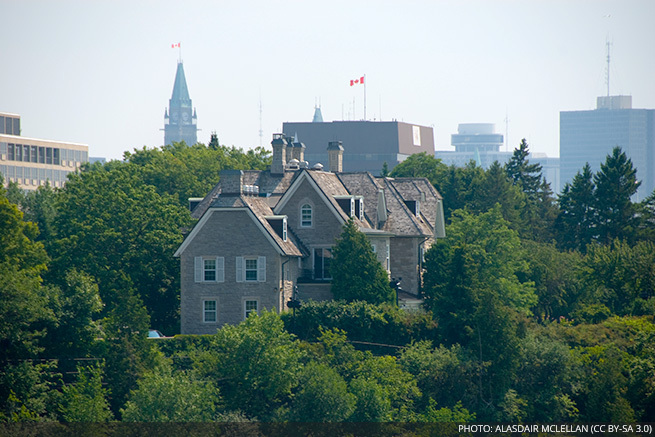 OTTAWA, November 2, 2015 – The Royal Architectural Institute of Canada (RAIC) is pleased that the condition and future of the Prime Minister’s Official Residence at 24 Sussex Drive in Ottawa is finally receiving much-needed attention. The RAIC, which advocates for excellence in the built environment, congratulates Prime Minister-designate Justin Trudeau for postponing his occupancy to give priority to the state of the “people’s house” for the benefit of all Canadians. The National Capital Commission (NCC) has done a good job of systematically upgrading and maintaining the official residences of Canada. Unfortunately, it has not been granted access to 24 Sussex Drive to do more than cosmetic repairs, resulting in the need now for a total overhaul. The RAIC supports the responsible approach of the NCC in seeking professional advice from its Advisory Committee on Official Residences of Canada, comprised of architects and experts in heritage, interior design, and real estate development. The RAIC recommends a thorough assessment of the property to ascertain its capacity to meet the operational, functional and programmatic needs of a prime ministerial residence in the 21st century. Recognizing that the NCC has architects, including a Chief Architect, and other professionals on staff, the members of the RAIC stand ready and willing to contribute in any way they can. In terms of sustainability, the history of the house, and its status as a federal heritage building, the RAIC recognizes that the first choice would be to rehabilitate the building if feasible. “Rehabilitation of a 19th-century deteriorated building into a more comfortable, efficient, safe and welcoming building is well within the realm of possibility with thoughtful design led by architects,” says RAIC vice-president Allan Teramura, FRAIC. Members of the board of the RAIC are available for interviews and to share architectural perspectives and expertise on this timely topic.